The deviation of the sun’s orbit (±17 minutes) could not be considered (see also: »Equation of Time« →). Automatic DST has pnly an effect when you move the 3rd slider button into the left half. The simulation is configured for temperate zone, northern hemisphere. The parameters are approximated and have no reference Accuracy. 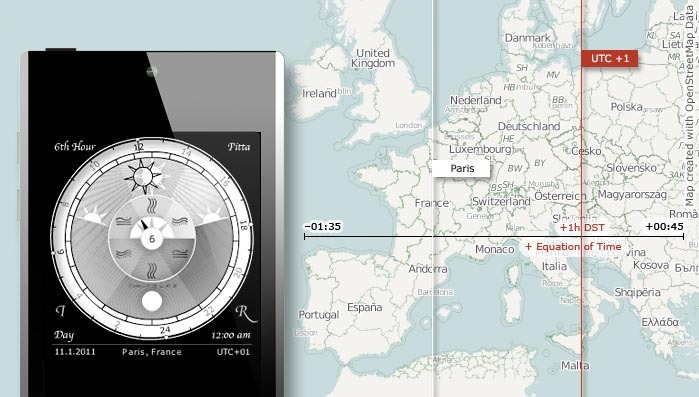 The »distance to time zone longitude« is limited to 3 hours. Move the distance fader to -1 hour, west. Set the day length to the left, on »summer«. At last turn the DST on [ DST on/off auto √ ]. The result are very different time deviation: no deviation in the morning, 2 hours at midday and even 4 hours in the evening. … does NOT mean the difference between time zones themself (e.g. UTC+1 to UTC+8). It is the distance/difference between the local mean time (LMT) of the time zone longitude and the LMT of a position/location INSIDE this time zone area. In this website its usually named »Time Zone Difference«. Westcoast south France ca. –1 hour, westcoast Portugal ca. –1,5 hour, West China ca. –3 hours, New York ca. +10 Minutes, Greenwich London ca. 0 timeunits. The longitude is at Google Maps and Co, usually the second value. For this simulation, it is sufficient to use the Longitude only as an integer (for example, –8). Winter time zone is the actual Time zone definition. In Germany this is e.g. +1. The daylight saving time zone UTC + 2 would lead to an incorrect result. This is awesome! Unlike this simulator, your mobile app does consider deviation of the sun’s orbit, right? Right — the real Ayurveda Sundail does of course consider the deviation of the sun’s orbit (Equation of Time: https://www.the-ayurveda-sundial-company.com/site/en/#equation-of-time) . Thank you for such amazing work! I have a question regarding solar hour length. I sampled data from the simulator into spreadsheet and from there it appears that length of solar hour is calculated by dividing day/night length by 12. On a longest summer day solar hour during daytime is fixed at 1:20 clock hours, and 0:40 during night time. It just seems a bit unnatural to me that solar hour length flips from 0:40 to 1:20 at sunrise, then stays at fixed length during whole day and again flips to 0:40 at sunset. I would relate to the way the day length changes during the year – it does not change, lets say, from 8 hours to 16 hours at March equinox. Instead, the length changes gradually, following sine wave pattern. I’m not an expert in this area, but it just seems to me that solar hour length also should change gradually during day and night. Well – our Sundial has not THE Sunhour, there are day hours and night hours. The borders are sunrise and sunset and the miday is always the middle of the day. Any kind of floating hour scaling is an error of thinking because you need to have a relation point to define a length of an hour. At the end you will have a fixed scaling with equal parts. The main benefit of a dynamic scaling is, you can be sure that at 6:00 a.m. solar time (1th dayhour) the sun is rising. At 9:00 a.m. solar time (4th hour) is the middle of the morning and so on. Means you can read the natural time directly without calculating or heavy brainwork. Where can I purchase one of your wrist watches? currently the wrist watches are still design studies. But we are working on wall clocks and architectural Installations. The first real sundial maybe finished early 2014 – we hope. Wrist watches are more difficult to create – but, thats the next.